This Sunday is the feast of Corpus Christi (Year C). We celebrate the mystery of the Eucharist, in which the bread and wine really become the body and blood of Christ while retaining the appearance of bread. In order for that to happen — to have Jesus Christ be really present to us — is hardly impossible for a God exists outside of time and space. But for us, it seems as if he is bending time. First: The Eucharist brings us to Jesus’ side on the night he died. Today’s reading from St. Paul describes this. He described what Jesus did on the night before he died and the fact that he said “Do this in remembrance of me.” In the lines following today’s reading, St. Paul makes it clear that this is not just a trip down memory lane. It creates a solemn obligation to recognize Christ in the Eucharist. The Catechism explains what is meant by “Do this in remembrance of me.” This isn’t the Stations of the Cross or the Sorrowful Mysteries of the Rosary — those are devotions that only help us remember the Passion. This is the real thing. “The victim is one and the same, the same now offers through the ministry of priests, who then offered himself on the cross; only the manner of offering is different,” says the Catechism. “In this divine sacrifice which is celebrated in the Mass, the same Christ who offered himself once in a bloody manner on the altar of the cross is contained and is offered in an unbloody manner” (No. 1367). Thus, the Mass literally puts us in two places at the same time: At the altar of our parish and the altar of the Lord. 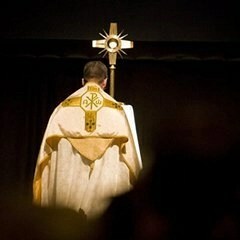 Second: The Eucharist brings Jesus to our side in our Church. The reading from Luke is often called the multiplication of the loaves, but Frank Sheed points out that it is actually a “multi-location” of loaves. In other words, the Gospel does not say that more loaves and fishes are made for the 5,000 families gathered around Christ — it says all of these people eat the five loaves and two fish that are available. This miracle is a necessary precursor to the Eucharist, says Sheed, because it helps us see how it is possible for Jesus to be both in heaven and in our church. Not only that, it helps us see how he can be in our church, and the church across town, and every Catholic Church in the world. Third: Our priest is a link in a chain that goes back to the apostles, and in fact back to Abraham. The readings show another connection we have in time with Jesus. He perpetuates his sacrifice through priests, and they are perpetuated through his Church. Jesus ordained the first apostles, they ordained others, and so on went the chain until your priest was ordained. During his ordination, your priest was told, “You are a priest forever, in the order of Melchizedek.” That’s a reference to today’s Old Testament readings about the mysterious figure who offers bread and wine at the dawn of salvation history. And so it is that Corpus Christi is the story of God searching for his people, longing for us to return to him and going to great lengths to reach us, even bending time.